Smart Print & Labels offer a wide range of Domed, (also known as Gel Labels or Bubble labels). Applications include Promotional Badges, Logos, Sports Equipment/ Footwear, Name/ Corporate Badges, Automotive Badges, Computer badges, White Goods Badges etc. A polyurethane dome is applied in resin form this will ensure the label will remain colourfast .This makes them are suitable for both interior and exterior use. 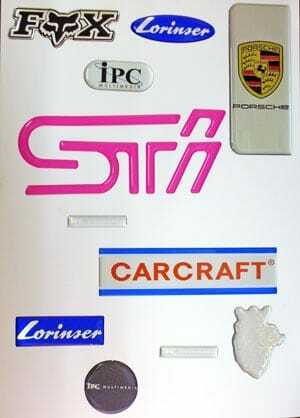 Typical applications include Computer labels and badges, Automotive trade, Nameplate badges, Point of Sale Displays, Sportswear etc. If you want to enhance your product resin badges/ domed labels are perfect for a professional finish. Recent years have seen growth in the market for Domed labels for a variety of uses which include name badges & product identification. Resin Domed badges are produced to make your labels stand out. The polyurethane dome brings flat labels “to life” making them aesthetically pleasing both visually & to touch. Not only is your logo enhanced via the dome but it is also better protected from the weather, elements & uv light. The above characteristics ensure domed labels are the ideal choice for labelling items in outdoor / hostile environments for example: white goods, vending machines and vehicles.